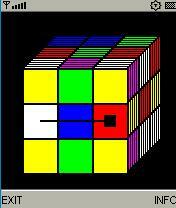 Cubesimu - a simulation of Rubik's cube. Automatic scrambling (adjustable delay time) and play mode. Useful as srceensaver and brain trainer.